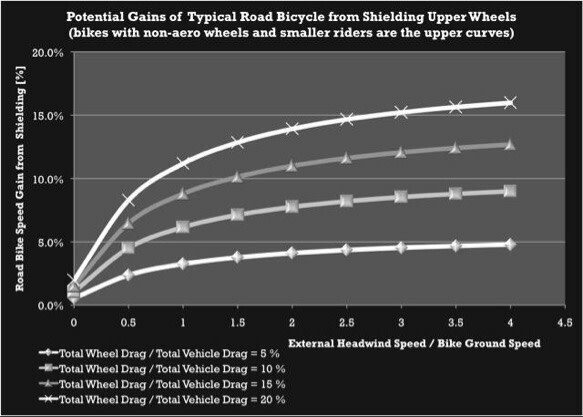 For maximum propulsive efficiency, rather than only reducing drag on the faster-moving upper wheel through streamlining aero-wheel rim surfaces, minimizing drag on these same upper wheel surfaces is more effectively accomplished simply by shielding these same surfaces from impinging headwinds altogether, including both tire as well as wheel rim surfaces. Our patent US 9,878,745 is also the first to teach that the highly magnified upper-wheel drag can be nearly eliminated entirely simply by using shielding to actually minimize overall vehicle drag; by only minimally shielding the critical upper wheel, overall vehicle drag is minimized; too much or too little shielding of the upper wheel then increases overall vehicle drag away from this minimized drag condition, being a system mechanics principle taught by the invention. 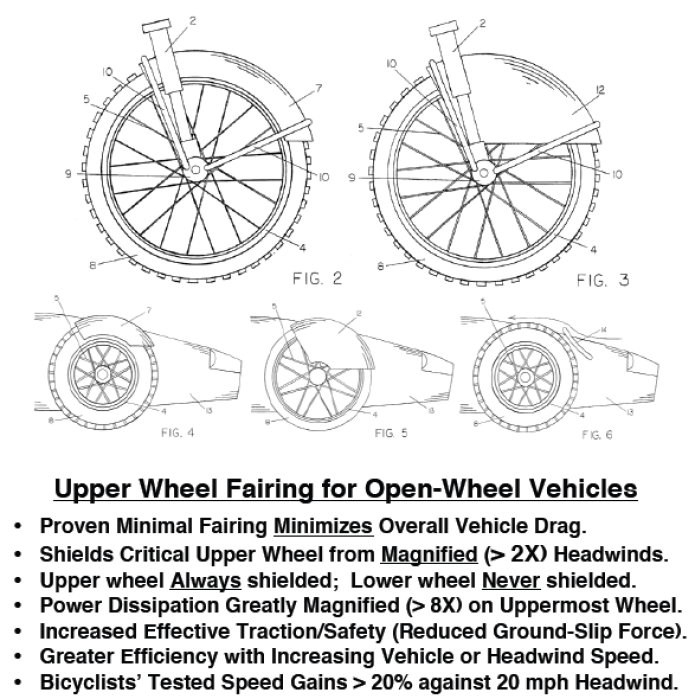 Thus, a new method for minimizing vehicle drag is taught by this patent: configure a minimally extended fairing shielding only the most critical drag-inducing uppermost wheel. We understand the natural skepticism that comes with these claims, as minimizing vehicle drag of open-wheeled vehicles has been a long-sought endeavor. Surely this idea would be been fully explored before by the automotive racing community, and yet to our surprise, it had not. In fact, we delayed ourselves many years before concluding that this idea still needed investigation. When we inquired (in 2018 at the Interbike trade show) to self-described Formula One aerodynamic experts from the U.K., they were dismissive, suggesting the same conventional idea: that surely this concept would have been explored before, and besides, everyone knows that there exists substantial drag on the lowermost part of the wheel. Not true! After all, a wheel that easily rolls over bumps can also easily push lowermost air aside as it rolls by. Try it yourself. Resist vehicle motion by restraining only the lowermost wheel surface. Then compare to restraining near the top. And our multiple downhill side-by-side coasting tests of bicycles using AERODEFENDER™ wheel fairings confirm their effectiveness test after test. 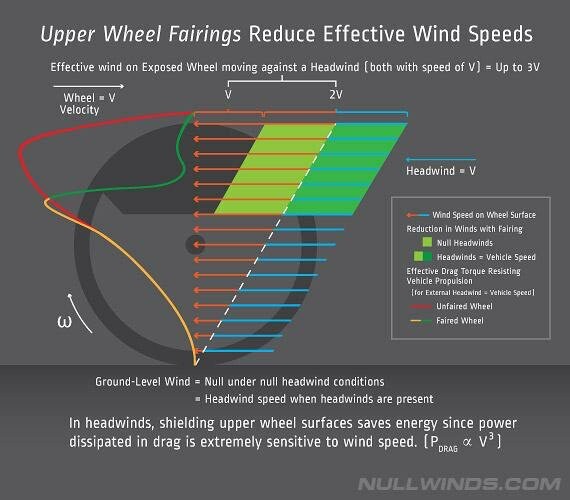 Shielding the upper wheel transfers higher drag otherwise induced on the faster critical upper wheel to the more aerodynamic slower moving vehicle frame, thereby reducing overall vehicle drag, especially when facing external headwinds or at higher speeds. And our first independent pro cyclists are also confirming our performance gains. 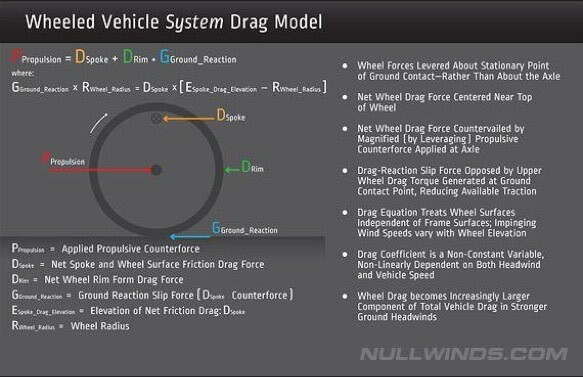 Indeed, the proper vehicle-drag mechanical model derived from our patent disclosure actually predicts enhanced efficiency with either increasing external ground headwind speed or with increasing vehicle speed. And these predicted gains are further confirmed with our road testing on bicycles. It remains to extend our testing to higher speed vehicles such as electric motorcycles and racecars. We are hereby soliciting interest from the racecar community. (Please contact us.) Still, industry needs to first understand this break-through drag-reducing technology before considering adoption, as it overturns decades of somewhat limited technical assumptions within the automotive racing community.